Become a YouTuber. Smart Video Recorder "GOM Cam"
Everything about recording your computer screen! Capture Whatever is on your screen! SEOUL, KOREA, March 22, 2019 /24-7PressRelease/ -- GOM & Company (www.gomlab.com) is moving toward becoming a specialized media company by developing and investing in new technologies and user-oriented media. 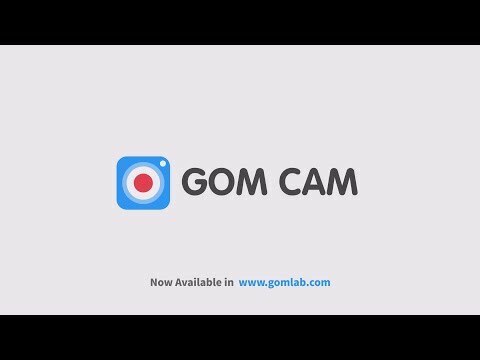 GOM Cam (https://www.gomlab.com/gomcam-screen-recording) is video recording software that is packed with useful features. It allows you to record anything on your computer screen whether that be YouTube, webcam, lecture presentations, and gaming screens. With GOM Cam, you can record what you see on your computer screen exactly as it appears. You can also capture images and customize your capture by drawing on the screen while recording. Not only can you record your screen, but you can simply edit them on GOM Cam instantly. • Easy Sharing: Share your videos on YouTube or upload your videos to Google Drive. • Extract Audio: Extract audio from recorded clips. • Lecture Recording: Functions for online class materials are provided in one-step. • GOM Cam Video Editor: Quick edit and advanced edit features. • Continuous Capture: Supported for your set time. • gif Animation maker: Make funny animated gifs. GOM & Company, which becomes 20th anniversary in 2019, is developing and investing in new media technology such as 360-degree VR, gesture control, etc. and filing patent applications related to the various media. We lead the way as a specialized media company that provides users with a fun and useful technologies through user-centered technologies. * GOM Software: GOM Player Plus, GOM Mix pro, GOM Cam, GOM Audio, GOM Encoder, etc. GOM Cam allows you to record anything on your computer screen as YouTube, whether that be a webcam, lecture presentations, and gaming screens.